EcoQuip’s amazing new technology is unlike any other so called “Dustless” abrasive blast equipment. After having seen the two videos above look at competitive videos online and notice the difference. EcoQuip has redefined how Vapour Blasting is delivered with their state-of-the-art equipment and blast pots pressurised hydraulicly. Because of this and other unique and patented features, the delivery of abrasive medium and vapour through the blast nozzle is smooth and even with no surging or gulping. Using less than 1 litre of water per minute and half the abrasive, EcoQuip still manages to deliver more energy on impact, resulting in the fast removal of heavy rust and old, thick coatings. Due to its rugged design, simple controls and reliable operation, EcoQuip is the preferred choice for contractors and hire companies around the world. Any abrasive heavier than water such as Garnet, Crushed Glass or Walnut Shell can be used. Built by Graco with their legendary quality, blast pots are uniquely coated inside and out, frames and many fittings are made of stainless steel and controls and valves are of the highest quality. These units are rugged and reliable, ensuring years of trouble-free service. 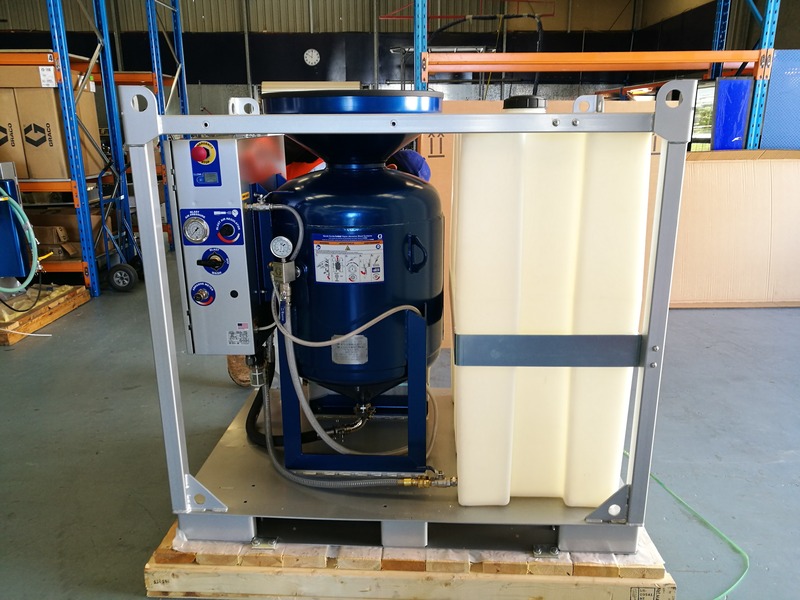 “Graco’s Australian Territory Manager called us at Liquimix one day and said that because of our strong connection with the supply of polyurea coatings into the civil, mining and construction markets, he had something new to show us. Within a few minutes of his visit, we were convinced this was something truly useful….something our abrasive blasting and protective coatings customers had been waiting a long time for. We immediately ordered the largest unit and had it flown in to show our customers” says Neill Barrell of Liquimix. Not only is the system fast and reliable but it also cleans the substrate and removes soluble salts from concrete and steel. Flash rust is easily prevented by adding Liquimix’s formulated STAYBRIGHT directly to the water in the holding tank. StayBright is incredibly economical and is used at 0.5% with water (5ml per 1L of water). The EcoQuip range includes the large EQ600S, for fast industrial use, through to the compact and fully portable EQ100M for Grafitti removal and other smaller jobs. There’s a unit to suit every application. Graco’s Vapour Abrasive Blasting equipment allows both FAST and AGGRESSIVE removal of heavy epoxy coatings and rust…with no dust…reduced abrasive…and using less than 1 litre of water per minute. It can also be gentle enough to remove graffiti without damaging the substrate. “The minute I saw EcoQuip’s vapour blaster working, I knew it was going to be a game changer. Now that I’ve used it for 10 days to remove heavy rust and thick epoxy, I’ve fallen in love with it”…Comment from a leading Australian Mobile Abrasive Blasting contractor and typical of what we at Liquimix often hear. 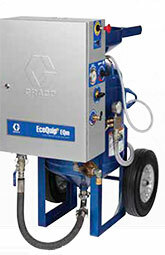 Call us now for Australia’s most competitive pricing on EcoQuip Vapour Abrasive Blast equipment.